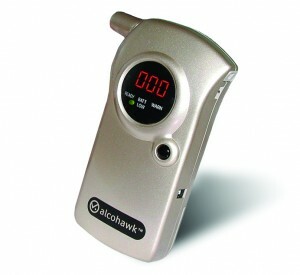 You are here: Home » Blog » AlcoDigital » Breathalyzer accuracy – want a cheapie? Breathalyzer accuracy – want a cheapie? This is the time of year where we sell a huge amount of the stocking-filler type detectors. Having a range of 39 different types generally allows us to have SOMETHING that the general public wants – whether in reality the chosen device is up to the expectations of the purchaser can be a very different matter. 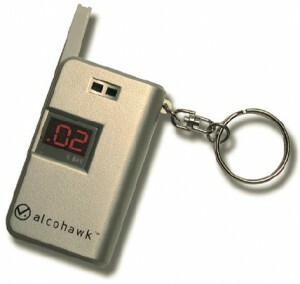 The AlcoHawk Micro is probably our most popular ‘cheapie’ device – a keyring unit with leather cover, its accuracy is quoted as plus or minus 0.03%BAC. Couple of things to bear in mind – this ‘quoted accuracy’ is under laboratory conditions at a set calibration point – not real life – and represents almost HALF the UK Drink Drive limit. A reading of 04 on the Micro could in real life easily be 01. Or it could 07 – just under the point you lose your licence. Not necessarily something you would use to decide whether or not you should get into that car. The unit retails at 3% of the cheapest Home Office approved device, and yet you would not believe the amount of people who buy them expecting them to be suitable for an employee-testing situation. Stocking filler, yes. Reliable device to define the sobriety of another? Are you serious? The lowest point we would suggest anyone looking at if they REALLY want a cheap device would be the original AlcoHawk Slim – at least unlike many counterparts it is actually a blow-through device (the ones you blow ‘at’ are frankly more likely to give an accurate reading in a cliff-side pub with no walls). Yes its a cheap device (retailing at £49) but it is pretty accurate (quoted as plus or minus 0.02%BAC) and the returns rate is low. Its newer sibling, the AlcoHawk Slim 2 is slimmer, prettier and so far even more reliable – definately one of our top sellers. Same style of readings, but newer software and much better looking. A bargain, at £64. At the top end of the ‘cheapie-range’ the ABI is hard to beat. It follows the same make-up of many detectors out there – (AlcoMate Pro, Hawk Pro, CA2000 etc) – again, reads in %BAC (UK Drink Drive limit = 0.08) but its hardy and robust, with a relatively low failure rate. Probably slightly easier to use than the Slim or Slim 2 purely in that its sensor recognises a lower blow-strength of sample, it is a very popular unit and one that I would not hesitate to recommend. The £79 price tag is money well spent. As with anything, there is very definately a case of ‘you get what you pay for’ in this industry. We deliberately sell a range of products from a range of companies as there is no ‘one-size-fits-all’. Unlike many other companies we would never knowingly oversell a product with outrageous claims as to its ability. If we don’t rate a product for your defined requirements we’ll tell you. All you have to do is ask.